It was a surprise invitation by Doris Hermon a fellow EMT on the Kiowa Ambulance Service approaching Gary to join the cast of the Borderline Theater in their bi-yearly stage presentation in Kiowa, Doris having performed in many of the productions since its conception. Gary no stranger to a stage with 19 years of music entertaining performances, but a novice to acting, declining the allurement of Doris’s offer. 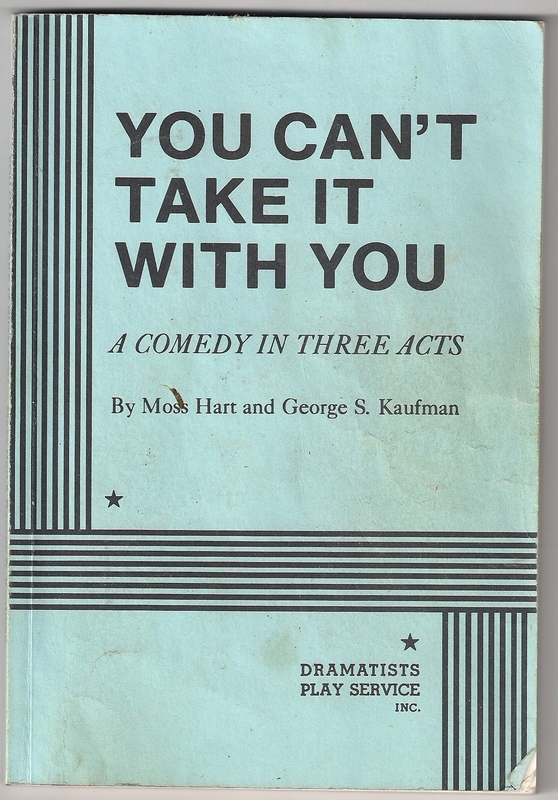 Doris was insistent, the play to be enacted was “You can’t take it with you”, a three act play by Moss Hart and George S Kaufman, also produced as a movie in 1938 starring Lionel Barrymore, Jimmy Stewart and Ann Miller. Doris knowing Gary’s background as a musician and accomplished on the vibraphone as well as the piano for many years could collate a featured part in the play requiring someone to play a xylophone. 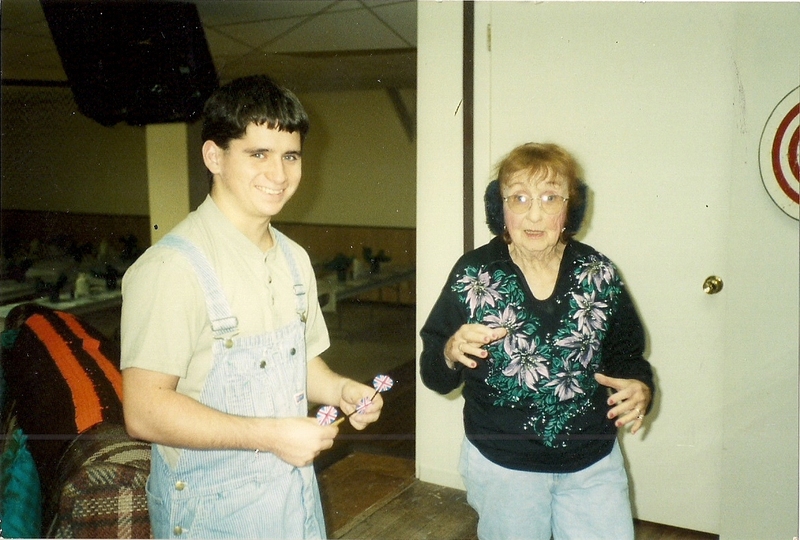 With Doris’s continued insistence, Gary being lead to believe he would have a minutiae of lines, finally agreeing to be present for the introductory rehearsal at the Kiowa Community Center. An arrival at the Community Center being greeted by many acquaintances and introduced to others that have participated in past play presentations. Tot Babcock, an elderly little lady was the director, a charter member of Summer Theatre of Empire State University, having acted and directed many plays at the college level, her daughter Bea Thurman, the Thurman’s a prominent farming family in Kiowa. 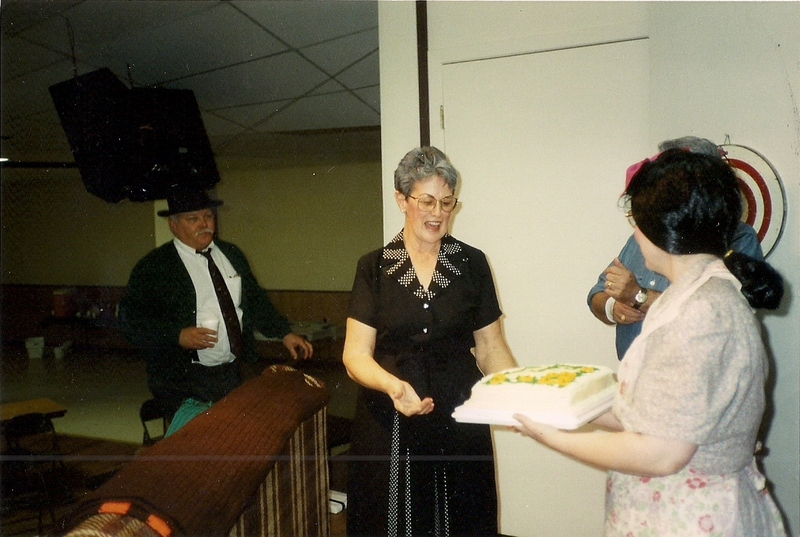 Members of the cast included locals from Kiowa and Hardtner, Doris Hermon, her husband Ed as lightning director, Kiowa Hospitals Dr. Marcia Drewry’s husband, David Worsdell, Bob Sterling owner of Yur Place and the Sterling Barn restaurant in Hardtner, Bob having the primary role played by Lionel Barrymore in the film production. 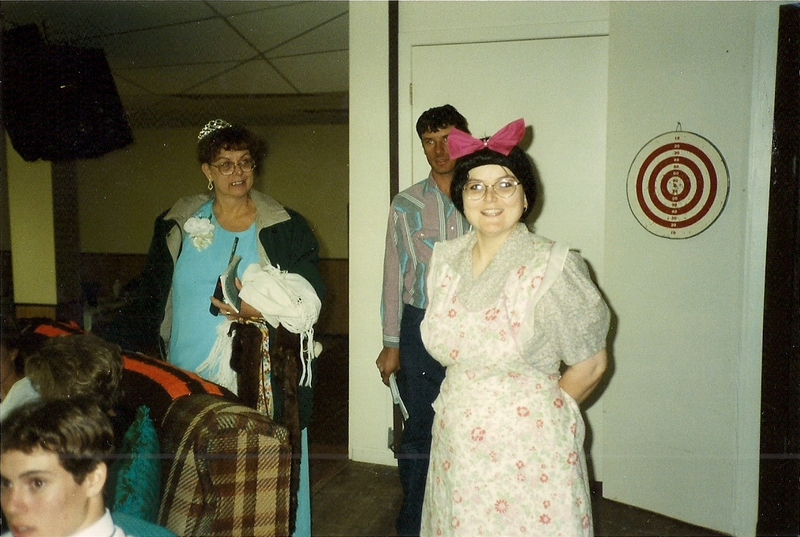 Other included Tommie Jo Hyde, a clinic nurse whom lived in Kiowa, Lisa Wahl a dispatcher for the Harper County Sheriff’s department, Bob Thomas, a rural mail carrier in Hardtner, Bruce Bryan the manager of Tuckers Farm Store, Donna Dyar whom was a substitute teacher and Krista Hill Pollack who would play Gary’s wife in his role of Ed, plus others complimenting the cast. The first rehearsal was an introduction to the play’s premise and a gathering of the full cast, Dramatist Play Service script books distributed to each cast member. Gary discovering that Doris’s description of his part as Ed having just seven or eight lines was in error, finding over 47 speaking lines in the play. 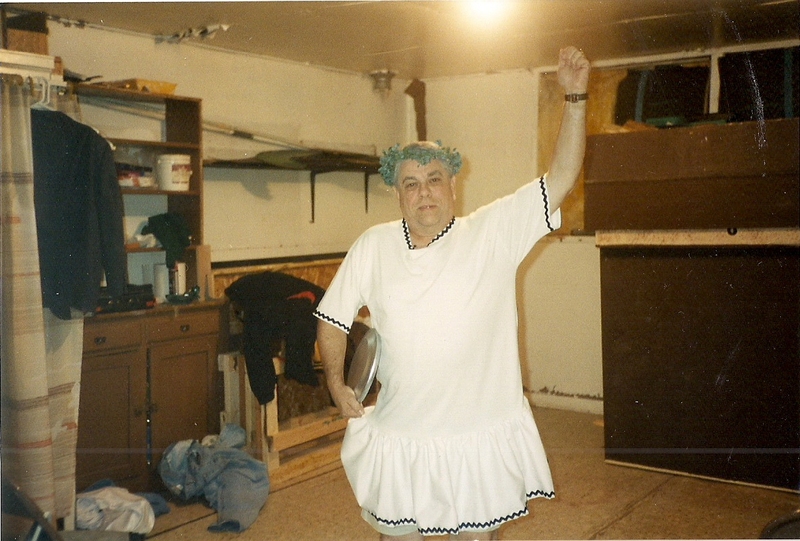 A bonus for the rehearsal was having Bob Sterling in the cast, his ownership of Yur Place restaurant and the catering Sterling Barn facility found him arriving for each rehearsal with boxes filled with morsels of sandwiches and snacks. 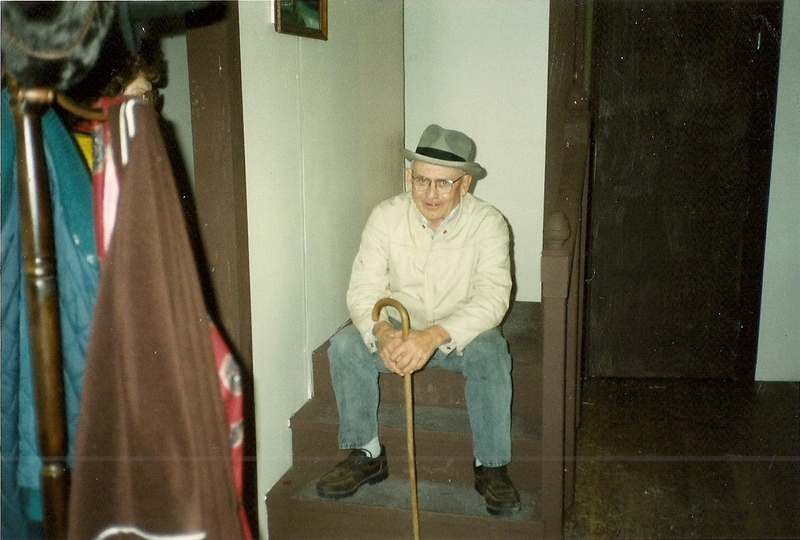 Weeks of rehearsals began for the three act play, the stage props being acquired, Lloyd Jacobs and Leon Eckert providing the stage construction, Mildred Farney and others assisting with costumes. Ed Hermon and Gary traversing to South Barber High School in Ed’s pickup to garner the music departments xylophone that they had generously loaned, a key component to Gary’s character and the play. Gary, at first somewhat hesitant to the progress, but once the cast was conversant to their lines was astounded to see the continuity of the scrip beginning to coalesce like a well written musical score, each actor an instrument providing its articulation. The cast spending the latter days of rehearsal ameliorating the interfacing concert of the script, the cadence of the play crucial to its conception being fulfilled. 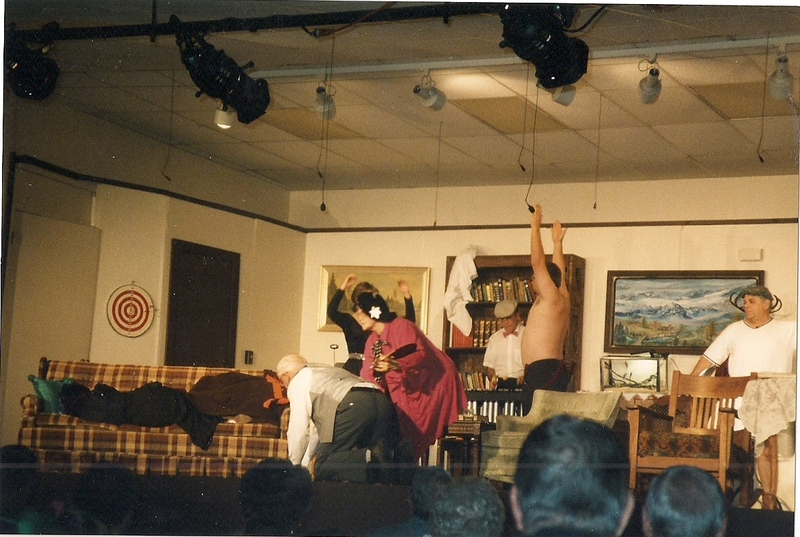 The three act performances wasn’t without incident. If one performer failed to give the right lead in line, it left the next performer in limbo, waiting for their cue. Gary discovering it was better to memorize, not just the lead in line but several before, enabling him to be ready. Behind the curtain off stage was Tot, with the total script available to cue a cast member if for some reason they had a lapse in remembrance. 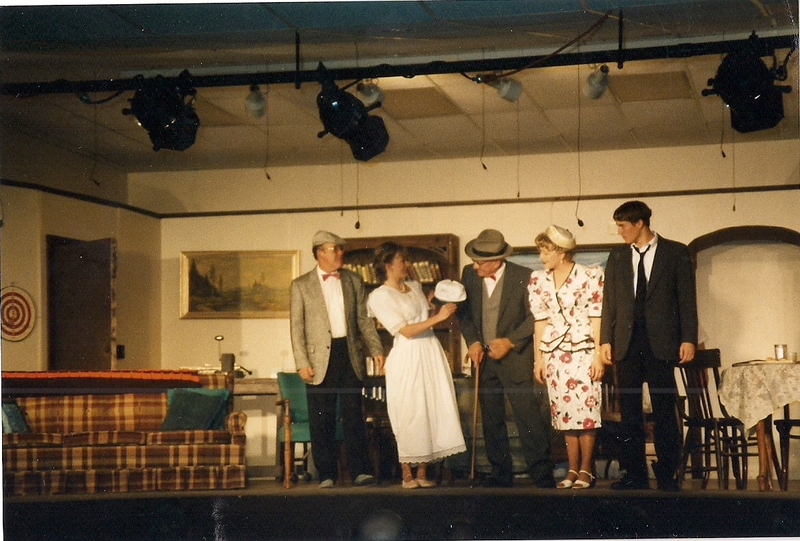 The total on-stage cast numbered 19, with a director, stage manager, lighting and sound technician and 9 others contributing to the pre-performance activity. 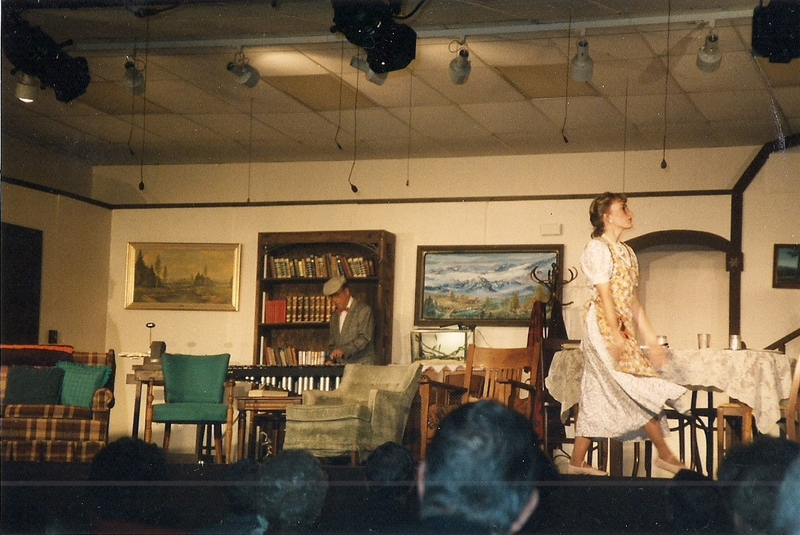 Gary’s role as Ed Carmichael, was to deliver Essie’s candies, operate an (antique) printing press, ( supplied by Rex Zimmerman, editor and publisher of the Kiowa News) and play the xylophone so Essie (Krista Hill Pollack, whom had taken ballet) could leap and pirouette across the stage. Gary adding some non scripted humor when operating the printing press, pulling out a dollar bill and placing it in the press. Tot, the director not apprehending his antics, but the audience availed. 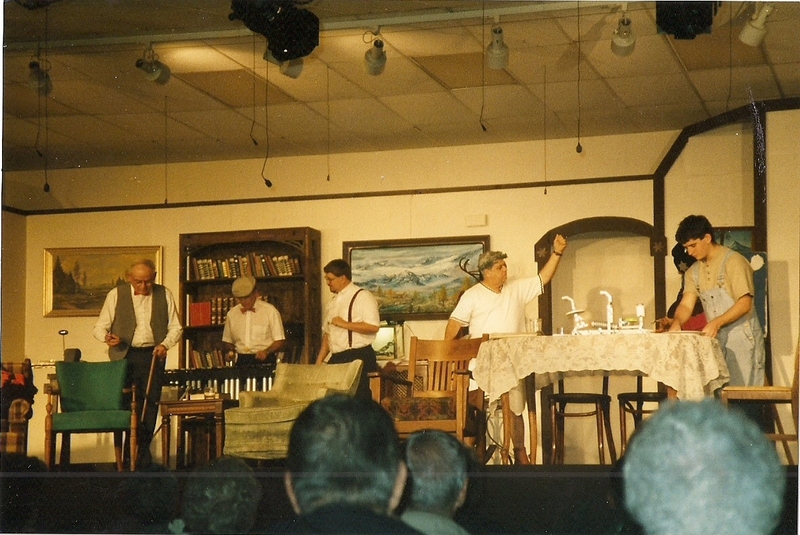 The scheduled run of the play was for consecutive Saturday and Sunday performances, the final Sunday a dinner theatre presentation, all performances playing to a capacity audience. 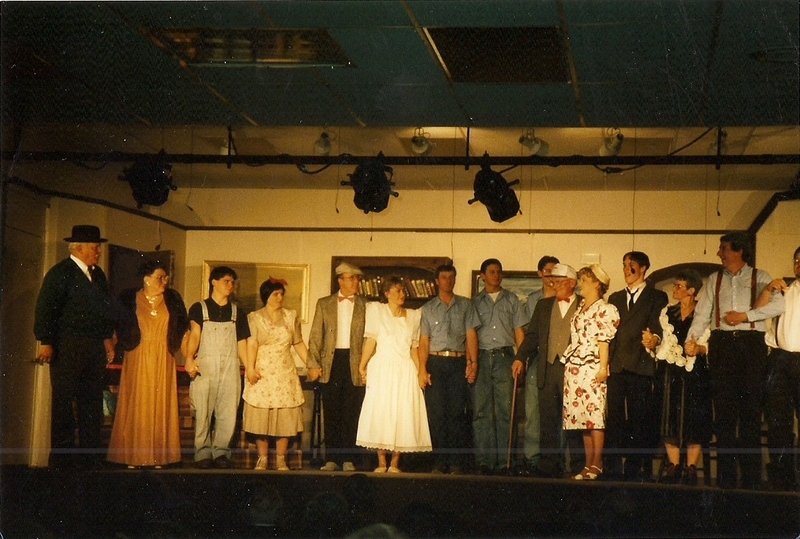 At the conclusion of each presentation, a stage introduction of the performers, followed by the cast lining the exit to greet and be greeted by those in attendance, mostly Barber County residence. Gary acknowledging many acquaintances from his many years of employment at John Deere, The Grade School, Kiowa Hospital and his service on the Kiowa Ambulance. Gary enjoying the experience of once again ascending a stage after a twenty year vacuity, even in a different venue, not exactly the musical foray of the piano as in years past but the new endeavor of theatre. The Border Line Theater production of 1937 Pulitzer Prize Play, “You Can’t Take It With You” was another consummating episode in his life. 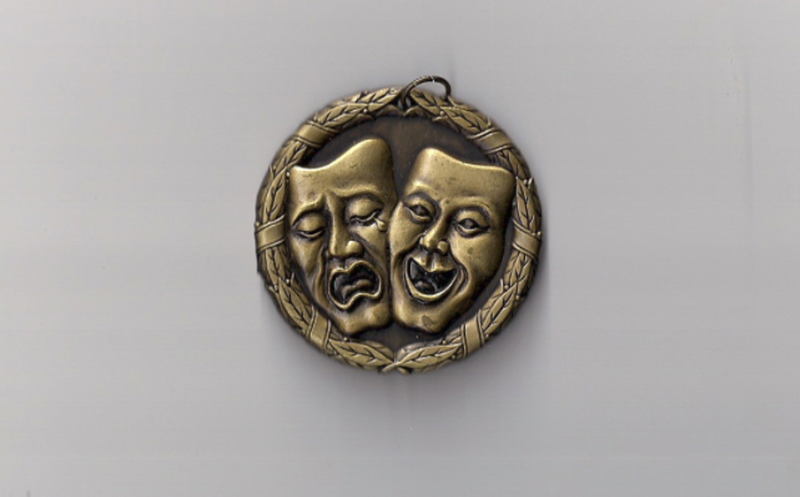 A Global Drama Theatre Medallion, academic medal award for drama theatre achievers, presented to the each cast member with a personalized inscription on the back. This entry was posted on February 8, 2016 at 11:53 pm and is filed under Uncategorized. You can follow any responses to this entry through the RSS 2.0 feed. You can leave a response, or trackback from your own site.